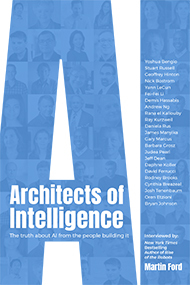 I’m pleased to announce the release of my new book, Architects of Intelligence: The Truth About AI from the People Building It. Demis Hassabis (DeepMind), Ray Kurzweil (Google), Geoffrey Hinton (Univ. of Toronto and Google), Rodney Brooks (Rethink Robotics), Yann LeCun (Facebook) , Fei-Fei Li (Stanford and Google), Yoshua Bengio (Univ. of Montreal), Andrew Ng (AI Fund), Daphne Koller (Stanford), Stuart Russell (UC Berkeley), Nick Bostrom (Univ. of Oxford), Barbara Grosz (Harvard), David Ferrucci (Elemental Cognition), James Manyika (McKinsey), Judea Pearl (UCLA), Josh Tenenbaum (MIT), Rana el Kaliouby (Affectiva), Daniela Rus (MIT), Jeff Dean (Google), Cynthia Breazeal (MIT), Oren Etzioni (Allen Institute for AI), Gary Marcus (NYU), and Bryan Johnson (Kernel). Architects of Intelligence was selected as a Book of the Year for 2018 by the Financial Times. I’ve been working with the French bank Societe Generale and its ETF subsidiary, Lyxor, to create a stock market index and ETF focused on companies that will participate in the AI and robotics revolution. Our approach is unique in that it incorporates not just companies creating AI and robotics technology but also those best positioned to benefit from these advances. As a result our index/ETF provides much more diversification than competing approaches. The ETF (ticker ROAI) started trading on September 18, 2018 on the London Stock Exchange in U.S. dollars and on Xetra and Borsa Italiana in euros. On July 5, I’ll be participating in a conversation with White House Chief of Staff Denis McDonough and Zipcar co-founder Robin Chase about robots and automation and what they mean for the future. The event will be live-streamed from the White House starting at 1:15 EDT. Details are available on the White House blog. Update: A video of the session can be seen here. Topics included potential for AI/robots to create unemployment, basic income as a solution, and even the potential threat of superintelligent AI. Are we prepared for the robotic revolution? Google’s recent announcement that its DeepMind technology had defeated one of the world’s highest-ranked champions at the ancient game of Go is just one example of the many dramatic advances unfolding in the fields of artificial intelligence and robotics. Machines are rapidly taking on ever more challenging cognitive tasks, encroaching on the fundamental capability that sets humans apart as a species: our ability to make complex decisions, to solve problems — and, most importantly, to learn. DeepMind’s feat was especially remarkable not just because the technology ultimately prevailed, but because the system largely trained itself to do so. Is U.S. Economic Growth Over? Robert J. Gordon, an economist at Northwestern University, has recently published an important new book, The Rise and Fall of American Growth, which argues that the U.S. has entered a new age of stagnation in which our hopes for an ever more prosperous future will largely evaporate. 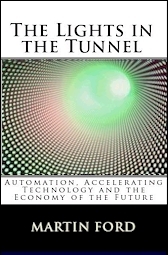 While Gordon’s argument is often characterized as being the opposite of the one I have made in my two books about the impact of advancing automation technology on the job market (most recently, Rise of the Robots), there are many areas in which I think we would agree. There are many interesting speakers presenting provocative ideas, including Paul Krugman and Naomi Klein. This is a discussion about my book, The Rise of the Robots, which is releasing on the UK on September 3.